Welcome to winter, our favourite time of year for Gorge Scrambling in Brecon. The rivers are now back to full levels offering great conditions for our Winter & Springtime Gorge Walking programmes. Remember the Brecon Beacons are within easy access of the M4 and only 20 minutes drive from Swansea or Cardiff. Gorge Scramblng or known here in Wales as Gorge Walking, takes place on the edge of Brecon Beacons National Park. Here in South Wales we have some of the best and exciting gorge walking and gorge scrambling in Wales with prices from only £30pp. What does a day Gorge Walking in Brecon, Wales involve? All under the supervision of your experienced guide. 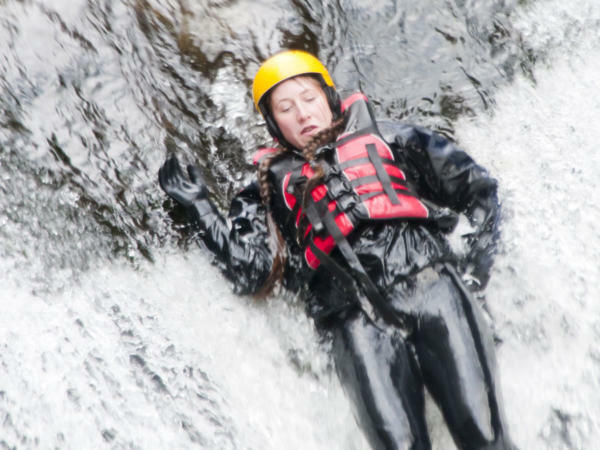 Who’s Gorge Walking in Brecon suitable for? Gorge Walking or Gorge Scrambling here in the Brecon Beacons is a fantastic physically demanding activity and is definitely one of our most popular activity days. Its ideal for groups and individuals, particularly school groups, company team building activities and without doubt our most popular activity for stag weekends in Cardiff, Wales. Suitable for children aged 11 years and above. 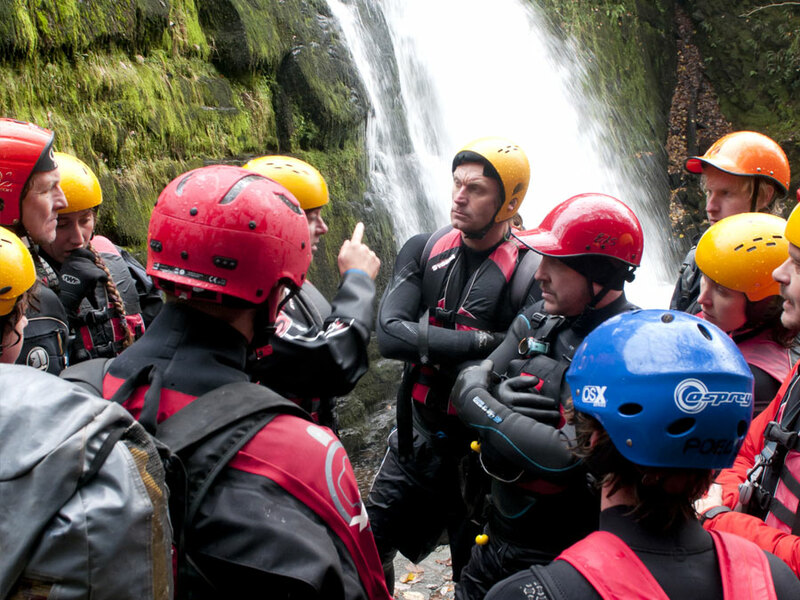 Without doubt Gorge Scrambling is our most popular stag activity for all locations around Cardiff and Swansea. Our Gorge Walking/Gorge Scrambling day is a full day. The Adventure centre is only 20mins from Wales capital city Cardiff and Swansea, the perfect gateway to your Gorge Scrambling day from Cardiff City Centre. 10am Gorge Scrambling day Register and meet your instructors. Get all your Gorge Walking kit, wetsuits, buoyancy aids and helmets. Travel to the gorge scrambling venue at Pontneddfechan, Neath on the edge of the Brecon Beacons, approx 20 minutes drive from our centre. 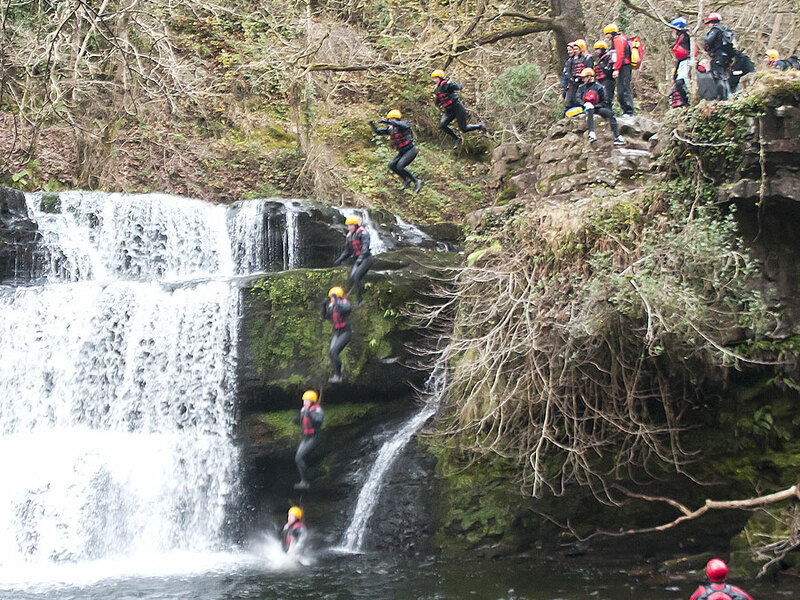 After a safety briefing, Enjoy a full day Gorge Scrambling with your mates in an epic setting here in the Brecon Beacons. The Gorge Walking day finishes at the venue approx. 3pm. Our Full Gorge Scrambling/Walking day is only £55pp. Mid Week special deal only £45pp. We also offer some great deals for groups at £30pp for 1/2 days mid week & Sundays. 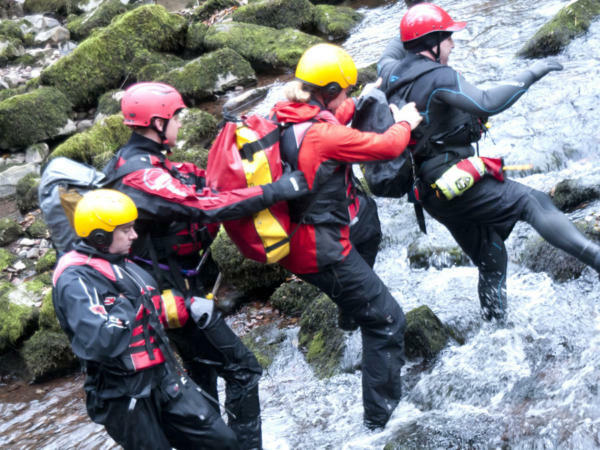 What do I need to bring for Gorge Walking in Brecon Beacons? We ask you to bring along swimwear, towel, pair of shorts and trainers or walking boots to wear in the river. All you need to bring extra is 100% attitude. Gorge Scrambling is definitely our most popular activity for Stag Groups staying in Cardiff or Swansea. Call us now for details of our Brecon Gorge Scrambling days 01656 782300 or why not simply click on our quick enquiry form and we’ll get back to you asap. We had the gorge walking event on Saturday for our stag weekend and wanted to say everyone who attended from my group had a great time. Was an excellent event which kept everyone involved the whole time, our guide was great and the setting was fantastic. The name of the guide escapes me but please pass on my thanks.